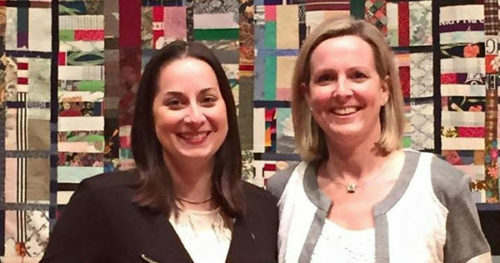 A historic Baptist church in Washington, D.C. that broke ties with the Southern Baptist Convention five years ago over several issues, including its opposition to the LGBTQ community, has chosen a lesbian couple to lead its congregation. Co-pastors Maria Swearingen and Sally Sarratt met members of the 155-year-old Calvary Baptist church last weekend, and will formally start in their new leadership roles next month. “As we met and talked with Sally and Maria about their vision for pastoral leadership at Calvary, we were struck by their deep faith and commitment to being part of a gospel community,” said Carol Blythe, chair of the committee that chose the couple as its new leaders. She made her remarks in a statement to Baptist News. One weekend after marriage equality was legalized in South Carolina, in November 2014, Swearingen and Sarratt wed. They were ordained to the gospel ministry by First Baptist Church in Greenville, S.C., one year later. “We have found it so easy to fall in love with Calvary and its longstanding commitment to be a voice of justice and compassion for those who perpetually find the wholeness of their humanity disregarded and maligned,” Swearingen and Sarratt said in a joint statement. Challenging the status quo is part of the church’s identity, as Calvary was started by abolitionists in 1862 and ordained Allyson Robinson, the first transgender Baptist minister, in 2014. According to Baptist News, Swearingen is a master of divinity graduate of Duke Divinity School, and has been serving as associate university chaplain at Furman University in Greenville, S.C. She earned her undergraduate degree at Baylor University in 2007. Her father is a Southern Baptist pastor, her mother is Puerto Rican, and she grew up speaking Spanish in a bilingual household. Sarratt is sabbatical minister at Greenville Unitarian Universalist Fellowship, and also works as associate chaplain for behavioral health in the Greenville Health System. After graduating from Carson-Newman College, she volunteered as a missionary in New York City, then earned an MBA and worked for several years in the corporate world, before returning to the ministry.